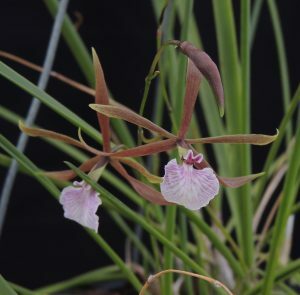 This is a small growing delicate little Encyclia. The species comes from Central America and we have seen it in Belize a few miles inland from Belize city. Encyclias are Laelineae and so related to Cattleyas and Laelias that tend to have tall pseudobulbs and thick stiff leaves. Encyclia bractescens is something of an exception with thin grass like leaves and small pseudobulbs. The long lasting flowers are large for the size of plant and although it seems slow to multiply up to being a specimen it is a rewarding plant to grow. In Belize we found it growing as an epiphyte in regrowth forest in one of the villages that form the Community Baboon Sanctuary http://www.belizehowlermonkeys.org/ which is actually a sanctuary set up more that 25 years ago with WWF support that set up skeleton forest in a group of villages in Belize. Skeleton forest is continuous forest shared with villagers who all keep 50 yeard of forest at the edge of their land. 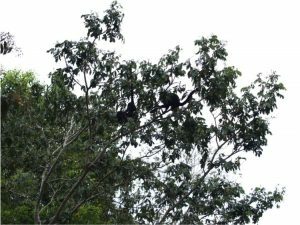 Although called a Baboon reserve it is aimed at protecting Black Howler Monkeys which we have met and enjoyed watching (and hearing) in Guatemala, Costa Rica and Belize. We saw Black Howler Monkeys in the reserve (see below) and lots of Orchids too. If you protect habitat for one species than all the biodiversity benefits. 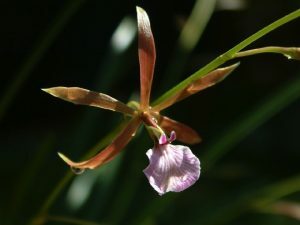 One of the orchid was Encyclia bractescens growing as an epiphyte on the truck of a small tree in fairly open forest and dappled shade (shown nicely on our photograph). The altitude was around 100m above sea level.